Cantankerous Kentias… Howeia Headaches… Paragon Palm… whatever you might call the Howeia fosteriana (Kentia Palm), it is a palm of mystery and beauty. 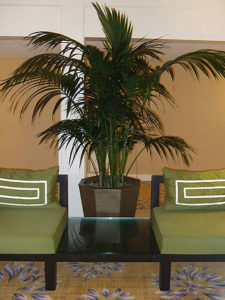 This palm is one of Plantopia’s more fashionable plants in the interiorscapes of clients across the United States. particularly in low light areas. 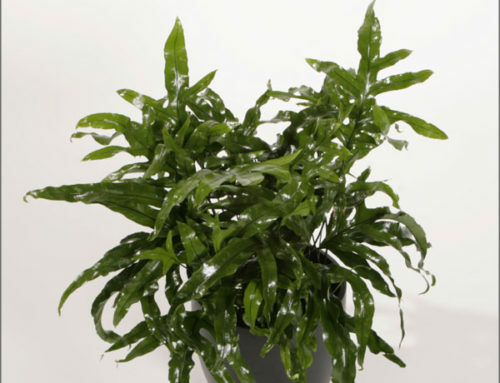 Its widespread popularity is due to its ability to thrive in low light areas, long lifespan, and durability. The ketia palm can survive in draftiest lobbies, greasiest restaurants, and most impersonal bank buildings. When most of us think about our version of a tropical paradise our vision always includes a few palms. These ancient tropical and subtropical plants are graceful symbols of warmer regions of the world. Unknown to most, palms are actually native to a wide range of climates including dry deserts, tropical beaches, and swampy shorelines. There are over 3000 species of palms worldwide. As interiorscapers at Plantopia, we commonly use just about ten species. All palms have unique botanical features that set them apart from other plants. Most importantly, they have only one growing point which is at the apex or end of the stem/trunk. This apical bud is the “heart” of all palms. Its removal from injury or disease will kill that stem of the plant. In addition, palms do not possess distinct vascular tissues called xylem or phloem that transport food and water through most plants. Alternatively, Palms have a series of vascular bundles randomly scattered throughout the trunk tissue. Palms also lack the cambium cells that are necessary for lateral growth in trees. A seedling palm plant stem builds up a trunk cone to its full width before upward growth begins. 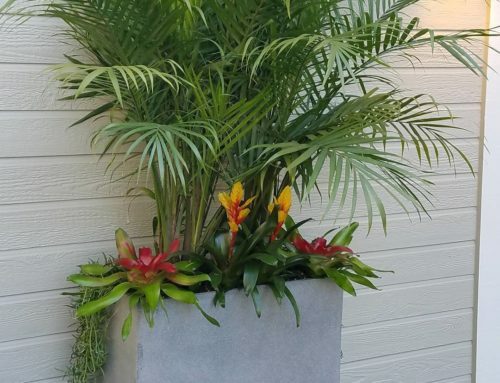 Ask any Plantopia technician and they are bound to come up with other interesting factoids about palms including that palm flowers aren’t showy and the fruit are usually a small one-seeded berry. Blooming is a fairly rare event in the interiorscape, too. 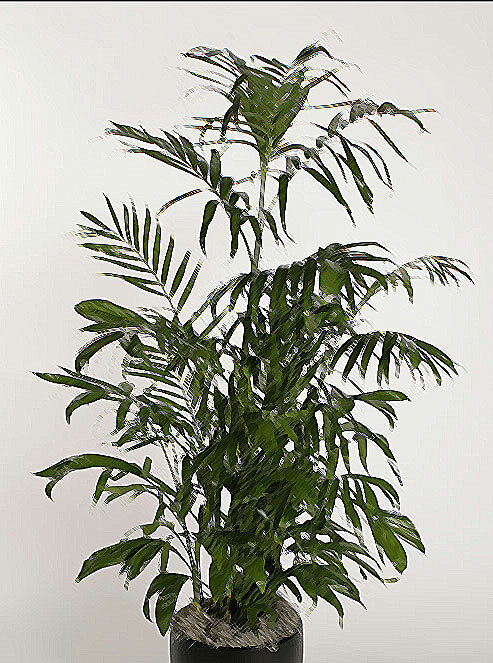 If your Kentia Palm should start to flower, your Plantopia interior plant maintenance professional will remove the bud to keep the energy going to the foliage. While many palms grow best in bright, direct sunlight in their native regions, indoors, palms prefer bright indirect light. Some, most notably the kentia palm, will tolerate low light for many years. Howea forsterana, the plant we call the kentia palm, is native to Australia. There, it starts its life as an understory plant shaded by the taller surrounding forests. Gradually, it grows to over 60 feet tall in the wilds. 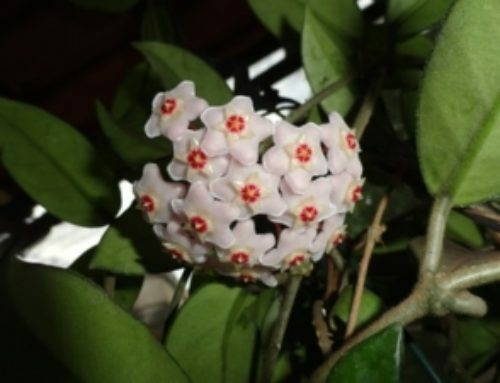 The genus name Howeia is from Lord Howe Island in the Pacific Ocean east of Australia. The town of Kentia on this island gives the plant its common name. The fibrous roots of a kentia grow straight down and grow best in containers if they are kept slightly potbound. Because of these traits (thick leaves, roots that tolerate containerized growth, slow growth with understory evolution) they are well adapted for indoor life. Howeias tolerate the hot, dry conditions of the interior environment and don’t mind the lower light levels so they are often included in interiorscapes. They need an ever so slightly, moist medium. In low light their root systems can be easily overwatered, causing root rot and eventual death of the plant. Your Plantopia gardener will keep a close watch on the water use with your Kentia Palm because determining those needs is tricky. This is partly because they are slow to give any signs that they are in trouble. If a Ficus is underwatered, there is a very obvious sign — hundreds of bright yellow leaves for all to see in a matter of a very short time. This is because Ficus are fast growers and therefore send out their communications quickly. Conversely, Kentias are slow growers and they take many weeks to send the visible signal to the foliage for us to “read”. The yellowing of the oldest leaf of a Kentia can be the result of underwatering from two to three weeks ago. Also, due to their slow growth, they are one of the most expensive plants Plantopia places in the interiorscape. 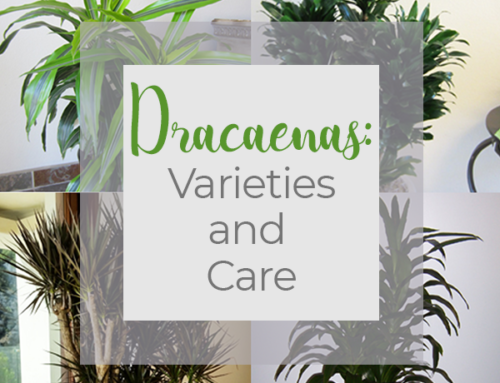 Each interiorscape setting has slightly different conditions and our technicians are quite sensitive to those subtle changes and adjust your Kentia Palm’s watering to fit. Like other plants, all Howeias benefit from cleaning. Regular maintenance by your Plantopia technician keeps them healthy and clean by washing or wiping the fronds using specifically designed cleaning agents. 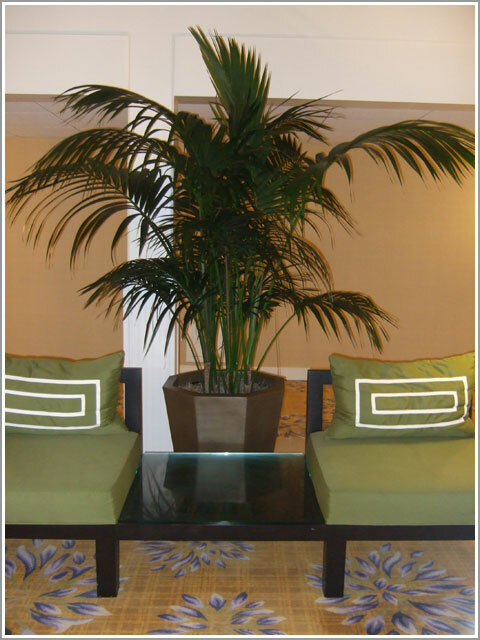 Don’t use leaf shine for all palms are very sensitive to chemicals- just call your Plantopia technician if your Palm is getting dusty because there’s nothing less attractive than adusty look in interiorscapes. Your Plantopia maintenance plan will include regular dusting, cleaning and systematic checking for bugs and mites. 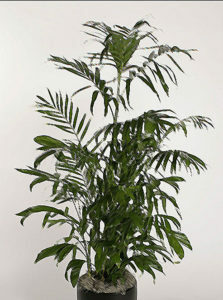 When given the proper care, Kentias are long living plants that will grace any interiorscape for many years. If you are considering a plant replacement or design recreation, please contact Plantopia for a free consultation!